I spent the first Monday of every month from 3rd grade until my senior year of high school at my orthodontist's office. The first time I got braces was in 4th grade. I had big buck teeth, and overbite, and just a pretty crooked mouth. My first orthodontist is a wonderful man, but his methods were a bit outdated. Instead of having the cool braces with colored rubberbands everyone else had, I had a metal band around each tooth that connected to another metal band with metal wiring (basically the braces on the far left in this picture). I had those until 7th grade, and then I had a retainer I wore religiously. The retainer was only for my top teeth (it looked like this), so by the time I got to 10th grade, my bottom teeth had shifted significantly. So I got braces on my bottom teeth, and those stayed on until a week before I graduated from high school. This time I wasn't even given a retainer. So needless to say, my teeth shifted over the next decade. It was always something I was self-conscious about - I spent so many years trying to fix my teeth that I really noticed other people's teeth, so I guess I was probably hyperaware of how mine looked. Many people tell me that they didn't even notice my crooked lower teeth because I smile without them showing, but I noticed them in every single picture and every time I looked in the mirror. In addition to my crooked teeth, my sister pushed my down a water slide when I was younger which chipped my front tooth, so my left front tooth is half fake. It was always a different color than my other teeth, more opaque, and eventually a different shape. I grew to smile with my mouth closed - I actually had a really hard time finding a picture with my teeth showing for the picture above! I wanted to fix my teeth, but I was mad that my parents had already paid for braces twice, and that I spent NINE YEARS going to the orthodontist and I still had crooked teeth. At the beginning of my first year of medical school, I went in for a tooth cleaning at a new dentist's office, and my dentist asked when I was going to have my teeth fixed. I explained I didn't want to go through with braces again at 26 because, well, braces. He gave me some info about Invisalign, and told me to think about. I went home that day and started a new savings account with my bank to start saving with my earnings I made from blogging. A year later, I made my appointment with my current orthodontist. Here's how the process works, my experiences, and most importantly: my before and after pictures! During the first appointment with my orthodontist, we discussed if I was even a candidate for Invisalign. I had braces twice before, and from what my orthodontist told me, he sees more people getting a revision of their teeth than he does first time braces wearers. 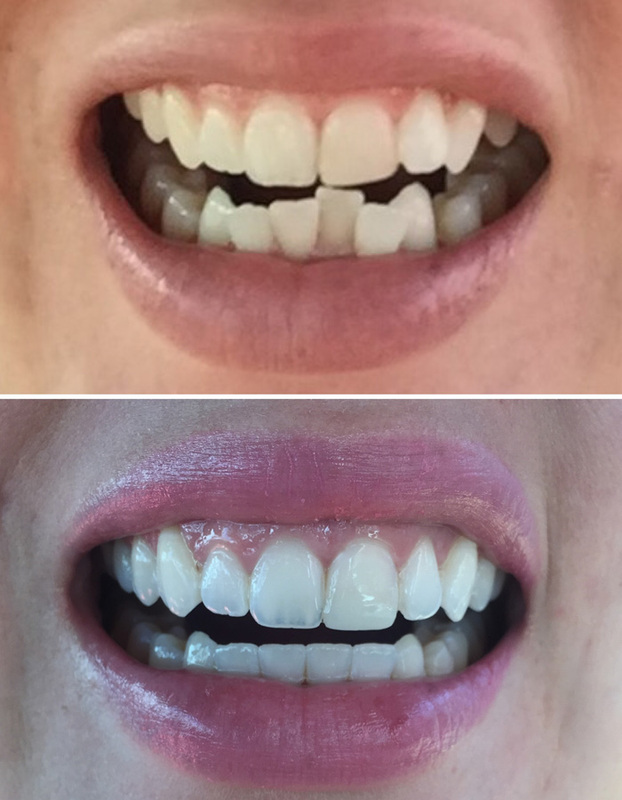 He said my bottom teeth were significantly crowded and crooked, and that while he couldn't promise perfect results, he was willing to give it a try with the Invisalign. During this appointment is when we hashed out the payment options (more on that below). During my second appointment, my orthodontist basically collected all of my mouth information. I had x-rays done, pictures were taken, and they took the impressions of my teeth. The way Invisalign works is that your orthodontist collects all of this information, and sends it into Invisalign. Invisalign then builds all of your trays, and sends them back to the orthodontist. Interestingly, the people who invented Invisalign aren't orthodontists - they were businessmen who were going through the trials of being an adult getting braces! During the third appointment, my orthodontist put attachments on my teeth. These are basically tooth colored hooks that go on the teeth that need a little more help, or are points of resistance (see an example here). I believe I had 3 attachments on the top and 4 on the bottom. This really varies between every mouth - I've read some people having up to 20 attachments. Then I received the first three sets of trays. Every two weeks I switched to the next set of trays, and then every 6 weeks I would go back to my orthodontist for the next three sets. I had 21 sets of trays total. I was debating sharing exactly what I spent on this process just because I know talking about finances is always a sensitive topic. But if I was going to discuss everything else, I thought it would only be fair to share that part too, especially for those people who find this post looking for other people's experiences with Invisalign. The entire process cost me $5000. I had saved up half of it before I started, and then my orthodontist had a 1 year payment plan with zero interest, so I paid the rest of it off within that year so I wouldn't have to pay 20% interest. Everyone's costs will be different, depending on the area of the country you live in, and how much work you need done. From what I've read about online, my price was a pretty average price. My orthodontist told me that it would cost just as much to have regular braces put on, which kind of sealed the deal for me. Anyone who has had braces knows the pain of having your teeth pushed around your mouth. It is no different with Invisalign. I would say that the first 4 days were the worst, with the worst pain being the night after starting a new tray. I usually just took a bit of tylenol the first night, and it was fine, but you definitely notice the uncomfortableness the first few days. By the end of the two weeks, it was so easy to take the trays in and out - it was actually pretty encouraging because you could see that your teeth were actually straightening! Most people didn't notice my braces. Sometimes they would notice me trying to sneakily take them off, and then comment that they didn't even know I had them! 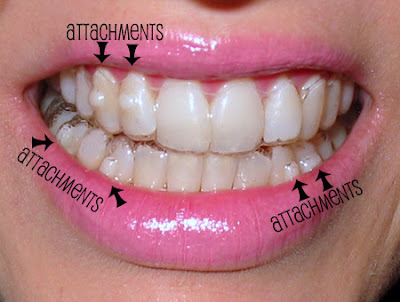 I felt they were pretty noticeable just because of the attachments and the fact that you have plastic on your teeth, but that just goes to show you that people don't really notice the things you notice the most about yourself. I had my attachments removed in the beginning of December, 48 weeks after I started with them. I'm currently in the step down phase - I still have to wear the last tray/now retainer every day for 22+ hours. After six months of this, I get to go down to 18 hours, and I think 3 months after that I only have to wear them at night. I'll be honest and say I don't wear them for 22 hours every day - some days I just get busy and forget to put them back on after eating lunch, so I'm probably more at like 18-20 hours right now during the week, and almost 24 hours a day on weekends. I plan on wearing the retainers at night for years though - there is NO WAY I plan on doing this for a fourth time. After years of being self conscious about my smile, I'm glad that I invested the money in myself to have my teeth fixed. I'm still shocked sometimes to see my mouth just because I was so used to my crooked teeth. I'm thrilled with my results, and thankful I was able to do this. I hope that answers some of your questions about the Invisalign process. Please let me know if you have any questions, and if you have gone through the process, I'd love to see your results!